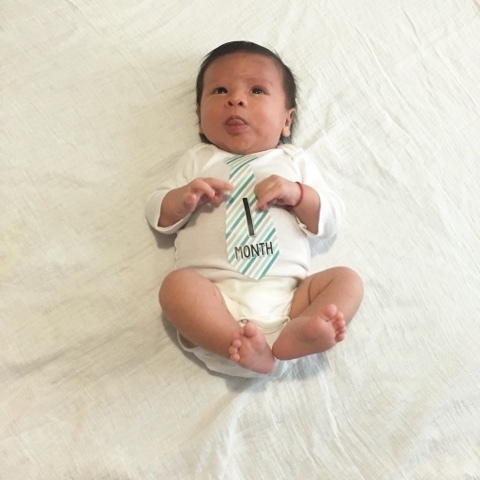 Lucas had his one month appointment today and I thought I'd do a baby update, both in case it's helpful for other moms and just so that I have to look back on when he's older. He's doing great and we are so thankful for his health-we are blessed. Lucas outgrew the newborn size a few hours after he was born (he was 9.8lbs at birth). He's currently using size 1. Mostly 3 months, some of his bottoms are 0-3 months. He did have two newborn outfits when he was born and used them a few times. Lucas loves to sleep, as any newborn would. Although he doesn't have a schedule and I basically nurse on demand, he has however, shown preference to a few specifics, at night mostly. Lucas basically only cries when he's hungry and/or has a dirty diaper. His cry is pretty adorable. Lucas is exclusively having breast milk, he has had a bottle with dad a few times, but has not had formula. He likes both the bottle and nursing with me, doesn't seem to mind. Loves being held, momma's milk, sleeping while drinking momma's milk, waking up at 5am to play, loves his hands on his face or near his face-ALL OF THE TIME. He also loves bath, especially getting his hair/head washed. Waiting for milk, getting swaddled and having a dirty diaper. Lucas is doing wonderful with keeping his head up alone, he recently started to really stare at me while nursing and others when they are talking to him. We have taken Lucas to very few places since he was born. His whole first week we spent at home. We slowly started making it out to parks-Esplanade, Castle Island... Target, the mall (once) and out to eat. Let me know if you have any questions or are curious about something, I would be more than happy to respond. Love the update on your little cutie!